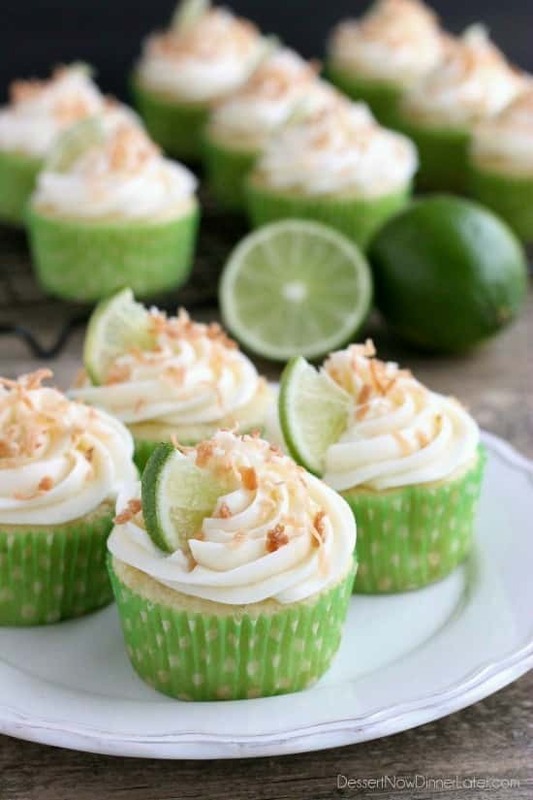 Coconut Lime Cupcakes - Dessert Now, Dinner Later! Okay, I waited as long as I possibly could before pulling out the lime desserts on you again this year, but it has begun, so if you like lime as much as I do, get excited! If you don’t…uh, what’s wrong with you?! I kid, I kid! Now I like my lime desserts super tangy, and unfortunately this one is not, but the coconut makes up for that! 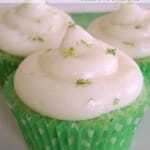 There’s coconut milk, lime juice and lime zest in the cupcake base. And the frosting, oh my! It’s my favorite cream cheese frosting with coconut extract! I love coconut almost as much as I love lime! 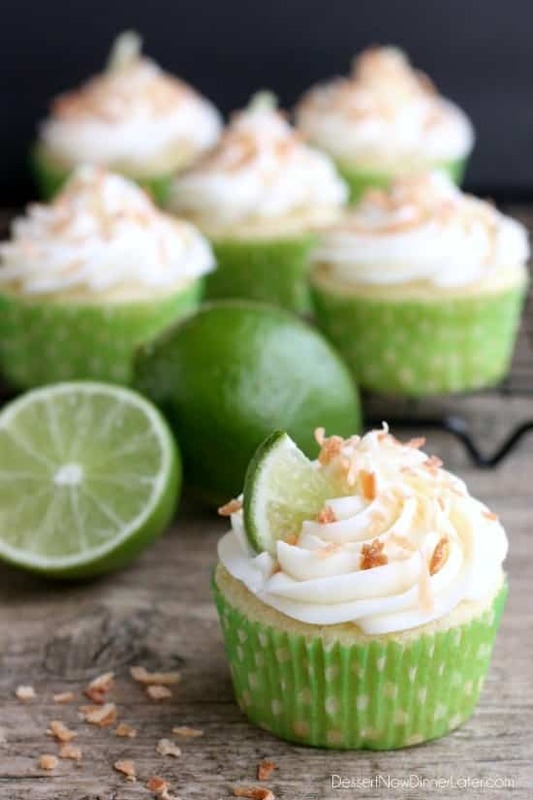 Since the lime is very light in flavor, my favorite way to eat these is to use that little garnish of lime on top and squeeze it over the frosting, then go to town on that cupcake! I also wait to put the toasted coconut on top until just before eating because it stays crisp that way and adds a great contrast in textures with the light, fluffy cupcake, smooth creamy frosting, and the crispy, sweet coconut! These cupcakes are pretty and delicious, and with the green wrapper and lime wedge on top, can make a fun “green” St. Patrick’s Day treat! Whisk the eggs and sugar in a separate bowl. Then add the oil, lime zest and juice, coconut extract, and coconut milk. Mix the dry ingredients into the wet ingredients until just combined. Do not over mix. Line a cupcake pan with paper cups and fill each cup ⅔ full. Bake at 400 degrees Fahrenheit for 14 minutes or until the cake springs back when lightly touched. (Alternately use a toothpick to test the center of a cupcake.) Allow cupcakes to cool completely. Make frosting by beating the cream cheese with a hand mixer. Add butter 1 Tbsp at a time and beat thoroughly after each addition. Then add the coconut extract and powdered sugar all at once and mix until just combined. Do not over beat frosting once the sugar is added. Scoop frosting into a pastry bag that's been fitted with a tip and pipe frosting on top of the cooled cupcakes. Garnish with a wedge of lime and sprinkle of toasted coconut. 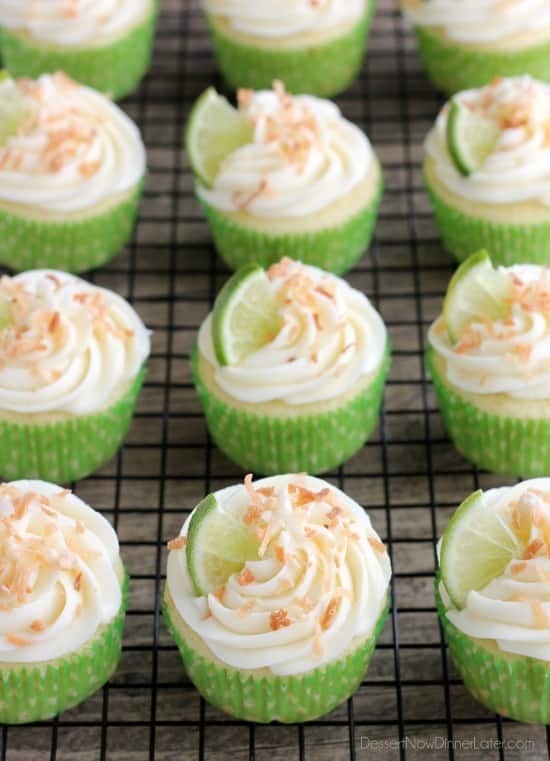 *For more lime flavor, squeeze the wedge of lime garnish onto the cupcake just before consuming. **Wait to add the toasted coconut until just before serving so it stays crisp. The longer it sits on the cupcake, the more it absorbs the moisture from the frosting and will go soft. Thanks June! They were beautiful and delicious! These look so pretty and tasty! 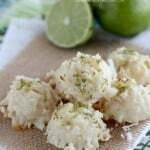 I love that you have so many lime/coconut recipes on your blog! Hooray for lime lovers! Thanks for pinning Lynn! These cupcakes look amazing! Love the lime and coconut flavour, so delicious! Thanks Jess! It was a great combo! These are some seriously gorgeous cupcakes, Amber! I just love your piping! Thanks Sarah! Every now and then I make a really pretty dessert! Yummo! These cupcakes are mouth watering, Amber. 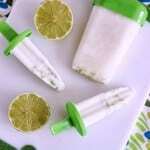 I love the lime and coconut combination. Thanks Jen! 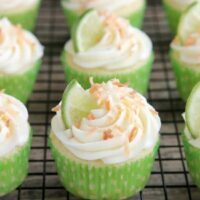 I really loved the coconut lime combo in a cupcake! These cupcakes are beautiful, Amber! 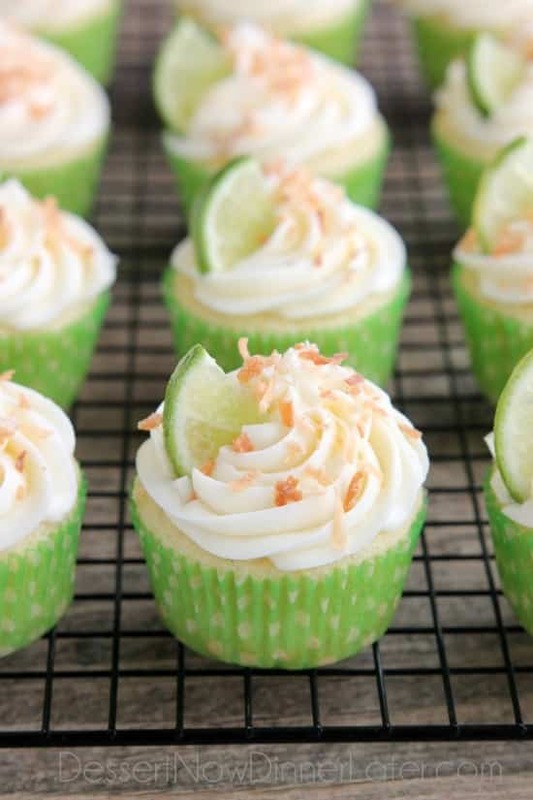 Citrus desserts are my favorite and I love anything coconut so these are perfect! So delicious! Thanks Kelly! I think you would really like these then! These cupcakes look like they belong in a bakery, Amber! So gorgeous! 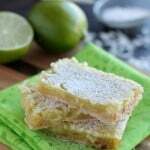 I love lime/lemon desserts, they’re right up there with chocolate for me. Love that you added coconut extract in with the frosting too, such a perfect touch. Could I prep the dry and wet ingredients the night before and then mix everything together in the morning and it still bake beautifully? I think that would be just fine. Re-whisk up the eggs well before adding the dry ingredients because eggs help leaven the cupcakes (helps them rise) as well as the baking powder and baking soda. I just opened uo the coconut milk in a can and its completely a soft solid…? do I turn the can upside down or add the solid part? You would need to whisk it up and then use it. If you use just the cream or just the liquid, it won’t be the same. Sorry for the delay in responding! Do you think these could be made using coconut flour?? Just made these and they were really good, they did not look so pretty because I did not have a piping bag with me at the time so I used a plastic bag, but super delicious!!! At least they were good, right?! Glad you liked them! do you know how many mini cupcakes this batter would make? I would say 32 to 48 and they wouldn’t take as long to bake. Maybe 8 to 10 minutes. hi there, would love to make this as a birthday cake. Do I double the recipe? Yes I would double it. Enjoy! These cupcakes were AMAZING! We made them for our neighbors and a homeless shelter, and they LOVED them! Oh I’m so glad you had a great experience with this recipe! Thanks for sharing! Hi! I have made the recipe as a cake already once and my family loved it, so I’m making it again. The only problem now is that i cant find the canned coconut milk would there be a problem if I use a boxed one? Thanks! That should work just fine as well. Glad you enjoyed them so much that you want to make them again! Hi, I’d like to ask what oil did you use? Can I use butter? Also, would it be ok to add lime juice to the frosting? I typically use canola oil, but vegetable oil or coconut oil should work too. You could use butter, but they may turn out drier than if you had used oil. If you want lime instead of coconut flavor in the frosting I would highly recommend using 2 to 3 drops of lime essential oil (like doTERRA) instead of juice. If you put too much liquid in the frosting it will get stringy and soft instead of stiff and pipe-able. Hi Amber, I’m going to make these gorgeous cupcakes, The flavour combination sounds yum. When you list ‘powdered sugar’ in the topping, is that like icing sugar? I believe icing sugar is the same thing. It’s also called confectioners’ sugar. Great looking cupcakes! Want to try to make them, what oil do you suggest? Thanks Krystall! I typically use canola oil in my recipes, but vegetable will work as well. I can’t say for sure, because I haven’t tried it, but I bet melting coconut oil would work for these cupcakes too. I hope you enjoy! Made these for my husband for Valentine’s Day coz he loves lime. They were definitely bakery worthy so light and oh so good. Definitely a keeper 🙂 Thanks for sharing. Awesome recipe! Is this plain flour? Or self-raising flour? Hi! I am making these right now but my icing did not turn out, it isn’t pipeable at all! Is it just because I beat it for too long? Oh! I also used a stand mixer not a hand mixer. Would this change anything? Hi Stephanie! I like using a hand mixer so I don’t over-mix it. Whatever you do, don’t add more powdered sugar. Try refrigerating it to see if it will help solidify it. If you over-mix the frosting it can turn stringy and soft. If you decide to start over on the frosting, try using only 1 cup of powdered sugar and 1 tsp of coconut extract. This recipe is a variation of my favorite cream cheese frosting, I love it! I made some today with lemon zest and lemon oil. Yum! Good luck! Holy cow, these were a massive hit at a baby shower I helped organize. I believe someone actually used the term “orgasmic”! I made these cupcakes today and didn’t experience positive results. First, the cupcakes were too oily. Next, they didn’t rise at all and had the consistency of a muffin. Lastly, there isn’t enough powdered sugar in the recipe to adequately frost all the cupcakes. I bake on a regular basis so I was able to make easy adjustment when making the frosting. I’m sorry you had a bad experience Kim. They worked out great for me or I wouldn’t have shared the recipe. You could try decreasing the oil to 1/3 cup, and increasing the lime juice by 2-3 Tbsp if you felt they were too oily. I have no idea why yours didn’t rise because the combination of baking powder, baking soda, and the high temperature of the oven usually does the trick. As for the frosting, I don’t pile it on high, so it was adequate for my taste, but I’m glad you were able to adjust it to meet your needs. Yes, you can use water or extra coconut milk in it’s place. Hi, I just want to thank you for these delicious cupcakes. I made them today for my coffe and cake shop that is located in Medellin, Colombia. They came out Beautiful. Hmmm….I checked and rechecked the ingredients before baking as my batter looked a little off and I had everything to the T. The cupcakes did not turn out good. The flavor was decent, but the texture was off. I didn’t even bother icing them so can’t say anything about that part of the recipe, but this was the first batch of cupcakes I’ve ever just thrown away. :/ Definitely won’t make them again.